Spring in Disneyland can be a popular time of year for guests to consider visiting. All of the flowers are in full bloom, the weather is warm but not hot, kids are out of school on Spring Break, and there are a variety of special events. Here are our pros and cons of visiting Disneyland during Spring. Consider this list alongside our guide to all the events at Disneyland in our when to visit Disneyland calendar. Although, in this guide we do aim to provide you with all the major 2019 events occurring between January-May along with some discount tickets to light your way! Visiting before Star Wars: Galaxy’s Edge Opens=Less Crowds! Valentine’s Month at Disneyland Celebrating Mickey and Minnie Mouse! Star Wars: Galaxy’s Edge- Not Yet Open! 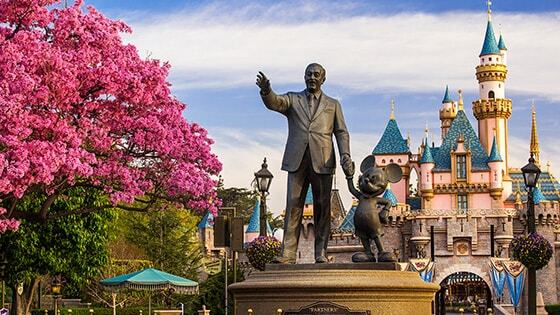 Here are all of the pros of visiting Disneyland in the Spring! These are all factors to consider as benefits to visiting the Disneyland Resort during the Spring time. Because of Star Wars land projected to open this summer, we highly recommend guests visit before the crowds arrive for Star Wars: Galaxy’s Edge! This list features all the events happening at the Disneyland Resort in the 2019 Spring to help you decide if this is the best time of year to visit for your group/family. Our travel partner is featuring their biggest sale of the year for travel to Disneyland during January-June and we highly recommend you take advantage of this opportunity to save big on discount Disneyland tickets and packages! You can save up to $95 per person on tickets. Every Disneyland tips and news site out there is projecting BIG crowds for the awaited opening of Star Wars: Galaxy’s Edge expected to open either late May or June at the Disneyland Resort. One of the biggest pros of visiting in the spring months of January-May? Not being in the parks for those large crowds! We also predict that Spring crowds will be much more minimal this year as many guests will likely wait to travel to Disneyland in the summer to see the opening of Star Wars: Galaxy’s Edge. Of course, you will still have to contend with the baby ducklings that come out in full force during the Spring but I think you’ll find them quite reasonable. And fluffy. Featuring a brand new high energy fireworks and projection spectacular, the return of the fantastic Soundsational Parade, and a wide variety of food offerings, this celebration is a super fun way to celebrate the 90th birthday of Mickey and Minnie Mouse. You can read our full guide to the Disneyland Get Your Ears On Celebration here. From January 22 through February 18, Disneyland will deck out the park in honor of Mickey and Minnie Mouse’s love as thee parks celebrate Valentine’s Day with themed decor, special food and beverage offerings, and souvenirs. This celebration will also include Minnie’s Valentine Surprise, a park-wide scavenger hunt that leads Guests on a search for the secret valentines Minnie has hidden for Mickey and friends. All you will have to do is purchase a commemorative map and stickers at select merchandise locations, find the valentines and redeem your completed map for a special surprise. You will also find plenty of themed treats, dining, and other sweet surprises waiting you if you visit around Valentine’s Day. See our perfect guide to a perfect Valentine’s Day at Disneyland here for everything you need to know. The Disneyland Lunar New Year event celebration kicks off on January 16th and ends on February 18th. You can expect to see a parade celebrating the Lunar New Year featuring Mulan along with marketplace food options featuring Korean, Vietnam, and Chinese offerings, special merchandise, and more. See our full guide to Disneyland’s celebration of the Lunar New Year here to plan your trip and enjoy the festivities! 2019 Easter Egg-stravaganza dates TBA. If you plan on visiting near the Easter holiday, you can expect to partake in the ever-popular Resort’s Egg-stravaganza in both Disneyland, Disney California Adventure Parks, and in Downtown Disney District. The Egg-stravaganza will last usually 2-3 weeks around the Easter holiday giving guests plenty of chances to join in the fun. All you need to do is purchase a map and set of corresponding stickers then hunt away for the eggs. Once an egg is spotted, place the matching sticker on the map. When all eggs have been located, return the map to the specific retail locations for a special prize If you want to keep your map and stickers unused as souvenirs rather than hunt, you can still return for your gift. Disneyland Park maps can be redeemed at Disney Showcase on Main Street, Disney California Adventure Park maps can be returned at Elias and Co. on Buena Vista Street, and just show your map in World of Disney Store in Downtown Disney District for a surprise there. Yes, there are THREE different hunts and a park ticket is required to enter both Disneyland and Disney California Adventure Parks. Discounts do not apply. And traditionally in past years, the Disneyland Hotel has hosted an Easter egg hunt on Easter morning near the Adventure Lawn. Younger guests of the Disneyland Hotel are invited to partake in the event but be sure to check with guest services prior. In addition to the Disney themed egg hunts, you can expect to enjoy Easter themed dining and treats during your visit! See our full extensive guide to Easter at Disneyland here to find out everything you need to know. The Food & Wine Festival at California Adventure Park is sure to please any foodie and wine fan in your group. This delicious festival includes marketplaces with tasty food, beer, and wine around California Adventure Park. There are also family-friendly seminars available with tips from special Guest presenters and an activity called Jr. Chef where kids can try hands-on cooking experiences! In addition, guests can enjoy live musical performances, and culinary demonstrations while enjoying high quality beer and wine. This year’s Food & Wine Festival runs from March 1 through April 23, 2019. Rounding out the spring events at Disneyland Resort is the ever-popular Dapper Day. Although not an official Disneyland Resort event, fans of eras bygone and vintage styles descend on the Resort for a weekend to share tips, pleasantries, and everything retro. Check out our full photo gallery of Dapper Day in Disneyland! And be sure to read all about in Dapper Day including dates and events in our Dapper Day Guide. This year’s Dapper Day event takes place on Sunday, April 14th at Disneyland with the Dapper Day Expo at the Disneyland hotel on April 13th and 14th. It’s hard even for the most avid Disneyland fan to imagine any cons of visiting during any time of year but there are always some things to consider! Here are the cons to visiting Disneyland in Spring this 2019 season. One of the biggest cons of visiting Disneyland this 2019 Spring is the fact that Star Wars: Galaxy’s Edge will not yet be open. Star Wars Land will feature two brand new high tech attractions that will fully immerse you in the Star Wars universe: Millennium Falcon: Smugglers Run and Star Wars: Rise of the Resistance. Disney has put over $2 billion into this new immersive Star Wars land- this is sure to be the most impressive addition we have seen to Disneyland in years. For those devoted Star Wars fans, it might be worth bracing the crowds for this new land and waiting until it opens instead of making the trip to Disneyland in the Spring. The average temperature in Anaheim in the Spring ranges from a high in the mid to upper 70s and a low of 50s. This is great weather for visiting the parks- when the sun is shining. Disneyland can feel hotter than most areas due to the amount of concrete reflecting the heat so if you visit in the Spring you can expect to feel warm but not overheated. But since March is one of the wettest months of the year at Disneyland, you can expect rain especially if you visit earlier in the Spring. Some find that a rainy day at Disneyland can be a blessing in disguise. Most crowds tend to empty out of the park when it rains which greatly lowers the wait times for rides! So you will see some die-hard fans see the rain as an opportunity and pull out their Mickey parkas and make a day of it at the parks. But it can also be a hassle for some guests so it’s an important factor to consider. If you are visiting in the Spring, we recommend adding parkas to your packing list. 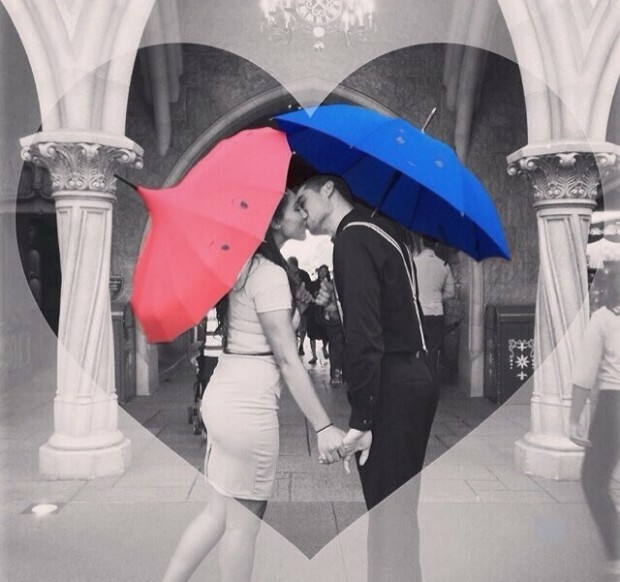 Try to avoid umbrellas- too much of a hassle in the parks! See our full guide to visiting Disneyland in the rain. For more tips and tricks for your upcoming Disneyland Resort vacation, subscribe to our newsletter. For more information on the Pixar Pier development, check out our latest article on the newest area. Previous Post: Get Your Ears On – A Mickey and Minnie Celebration: All You Need to Know for The Biggest Party of the Year! Next Post: First Disneyland Visit: Everything First Timers Need to Know!